In this section, Peter uses classical rhetoric, writing an “exordium” to prepare his recipients for what is to follow. The purpose is to prepare them to be more well-disposed and ready to receive his instruction. So, this section includes no explicit exhortations or commands. Instead, Peter wants his recipients to hear him without being defensive. Unlike what Paul often did, Peter doesn’t start off praising his recipients based on what they might be doing right. Instead, he praises God and what that means for his listeners. Peter begins by developing the last thought from his introduction, of being sanctified by the Spirit and sprinkled with the blood of Christ (1 Peter 1:2; also reference: John 1:13; 3:3, 7; Titus 3:5; 1 John 2:29, 3:9; 4:7, 5:1, 4, and 18). Peter does this by expounding on the activity of each Person of the Holy Trinity, offering a blessing based on the Father (vs. 3-5), Son (vs. 3, 7-8), and Spirit (vs. 10-12). What is the reason why someone is spiritually born? For Peter, Jesus’ rebirth from the dead (the “ana” of anagennao) brings a person into a spiritual birth by Jesus’ regeneration or rebirth from death. The idea is that God give us a new spiritual birth by connecting us to His resurrected, divine life (2 Peter 1:4). If true, why didn’t Peter use one of the words for resurrection, such as egeiro or anistemi? The benefit of this grace is a new birth into God’s family. Those united to Christ become “newborn infants” (1 Peter 2:2) and “children” (1 Peter 1:14), united in a “brotherhood” of faith (1 Peter 5:9). What Peter doesn’t write is how God connects someone to Jesus’ resurrection. He’s writing to those who already know this. Peter’s focus, instead, is on the effect of God spiritually birthingsomeone by Jesus rebirth to life in His resurrection. So, we now take a moment to review how and where Scripture tells us God joins us to Jesus’ regeneration/resurrection. How are we united to Jesus’ death and resurrection? If someone isn’t sure anagennao connects him to Jesus’ resurrection, Peter now explicitly says so. What does baptism give someone? Because Jesus rose from the dead and is now alive, we have a living hope. 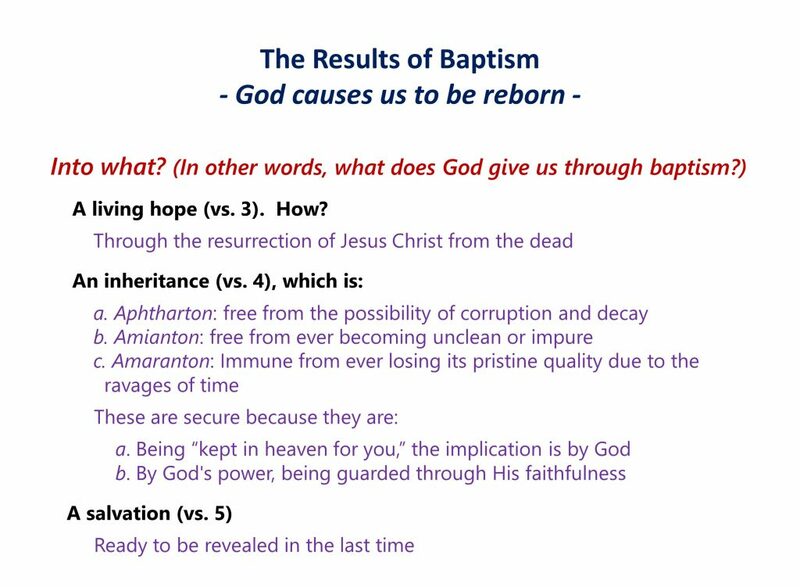 This hope is one part of what Peter says God give us through baptism (the other two are “an inheritance” and “salvation”). First, we explore what “hope” is, since our everyday usage differs from what the biblical writers meant. If someone could possibly think baptism is something he does instead of God’s work for him, what word does Peter use to show this isn’t so? “inheritance”: Peter builds on God’s promise to Abraham and his lineage (Genesis 12:7, Numbers 26:53-56, Deuteronomy 26:1) into a life of peace and prosperity (Jeremiah 2:7, 2 Maccabees 2:17). Peter now uses a triad of terms to describe some of the attributes of this “inheritance,” what they consist of. In the Asiatic style of Greek, he helps make this more memorable by using alliteration: aphtharton, amianton, and amaranton. The “a” before each is a “not prefix”: Not perishable, not defiled, and not fading. Why does it make sense for Peter to describe the characteristics of our inheritance based on what they are not? If something never perishes, becomes defiled, or fades, what must it then be? 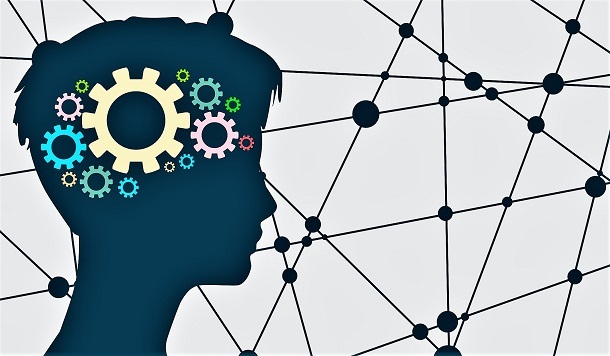 “kept in heaven for you”: The Greek (a participle, perfect-passive accusative) is awkward in English, “having been kept in heaven for you.” This is not a statement about location but about origin (God, hence the passive) and quality. How does Peter explicitly state in vs. 5 what he directed us toward in vs 4? “by God’s power are being guarded through faith for a salvation”: In Greek, “faith” and “faithfulness” are the same word. So, whose faith or faithfulness is Peter referring to? Grammatically, both “through your [the believer’s] faith” and “through His [God’s] faithfulness” are equally valid. The context and flow of Peter’s reasoning, however, is about God’s power and what He is doing, not the believer’s. Here, “by God’s power are being guarded through His faithfulness for a salvation…” is the better translation. The inheritance Peter refers to here is the future inheritance itself, not someone’s current status as God’s child and heir (1 Peter 3:7, Romans 8:17, Galatians 4:7). As a gift from God “in the last time,” it stands as something sure despite the uncertainties of the present age. Do Peter and Paul have the same view of what our Christian hope is? Often, we curse the sufferings we may experience. They are not enjoyable and bring heartache into our lives. As we grow in faith, the Christian may learn to see the hidden joy within such suffering—that these sufferings do not have the last word. Though this can be our experience, Peter wants us to understand something greater, which surrounds our suffering with a different reality. Peter begins, “In this you rejoice.” What is the “this” to which he refers? How can Peter say “a little while”? How does this contrast with what awaits the Christian? “trials”: Greek, peirasmos, can mean, trial, testing, or temptation. “Lead us not into temptation” in the Lord’s Prayer uses the same word. My child, when you come to serve the Lord, prepare yourself for testing [peirasmos]…. For gold is tested in the fire, and those found acceptable, in the furnace of humiliation. Trust in him, and he will help you; make your ways straight, and hope in him. “tested genuineness”: Greek, dokimion, “testing” as a noun. Though this is a genuineness, a dokimion is that which only comes through such testing. Now, we can understand how “the tested genuineness of your faith” can take place through suffering, but this still doesn’t explain why it may be “necessary.” The condition of suffering (a possibility) joined with the Greek, dei (it is necessary), reveals the suffering Peter mentions is that which becomes an inevitable situation for the Christian, not merely a possibility. Suffering becomes a necessity for the Christian because he cannot avoid it. This is the reality of sin’s corruption still affecting us now, individually and collectively. Who is the “him” in these verses? Peter’s wordiness is more than his Asiatic style of Greek. “Though you have not seen him” tells us Christ and our final salvation remain hidden from us until the moment of His revelation. “Though you do not now see him” focuses on the hiddenness of Christ in our lives, in the “various trials” (vs. 6) confronting Peter and the recipients of his letter. What are the characteristics of a Christian’s joy? “inexpressible and filled with glory”: For this to be so means such joy and rejoicing is something God enables, who will provide salvation (vs. 5, 9). Otherwise, joy such as this could not exist. What is the outcome of our faith? “soul”: Greek, psuche. This represents the essential life of being human. Go back to creation: Adam did not live until God breathed into him and he became a living “soul,” which included soul and body. Thus, “souls” bring us back to the life God originally intended us to have, which also included our bodies. Peter is using “soul” in a Jewish way, not in the first-century, secular Greek or modern usage of the word. Structurally, Peter surrounds Christian suffering with joy. 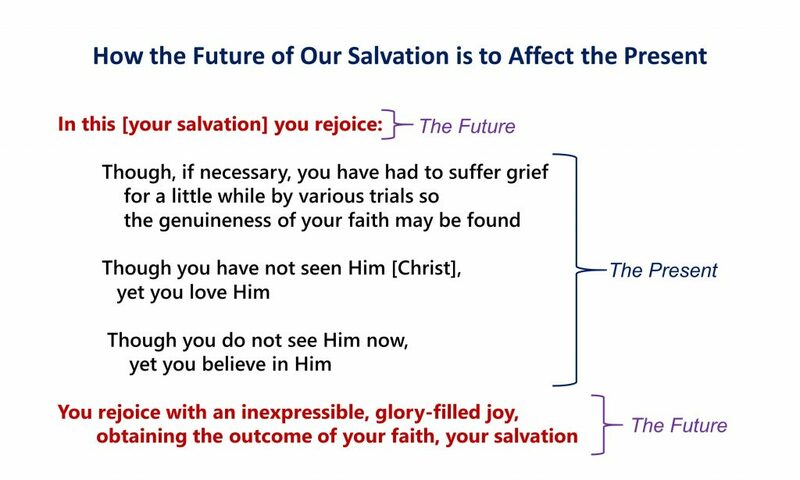 Our sufferings are a defeated enemy, fenced in by the great joy that is ours, from the future, bleeding now into the present because of Christ. You rejoice despite suffering, since suffering does not prevent joy. You are willing to suffer to glorify God. You are willing to suffer to obtain glory. Next week, we look at Peter relaying how God the Holy Spirit is involved in all this.